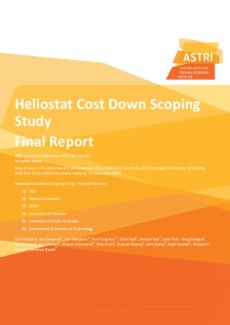 The Heliostat Cost Down Scoping Study is a preliminary activity led by the ANU, part of the ASTRI Node 1 program to reduce capital expenditure across an entire CSP solar field, and is the first step in a heliostat cost-reduction project to be carried out over the 8 year ASTRI program. The context for this report is the annual growth of the global CSP industry by 40% since 2005; it is expected that installed capacity will reach 4.5 GWe in 2013. There is unprecedented growth for power tower technology predicted for 2013, with 500 MWe expected to become operational this calendar year compared to the 65 MWe presently in operation. However, for growth to continue, the capital cost of the solar field must continue to be brought down. The cost of heliostats is presently estimated to be in the range 150-200 USD/m2 and the target costs for heliostats are generally in the range 75-120 USD/m2. This indicates that there is an expectation within the industry for large cost reductions. Leverage of performance: heliostat performance has a strong leverage on LCOE, and as a result the use of mirror with high reflectance is important. The benchmark is 3-4 mm silvered glass mirrors with solar-weighted spectral reflectance around 93-94%, but there is the possibility of achieving higher reflectance through the use of thinner glass and reflective films. Importance of O&M costs: O&M costs have a strong impact on LCOE when aggressive LCOE targets apply. Compatibility with low-cost cleaning systems is an important design requirement. The influence of solar field layout: heliostats deployed in power tower plants with >50% efficient power cycles are more likely to be arranged in a polar field rather than a surround field, due to the compatibility with cavity receivers. However, a surround field is also possible. Both field layouts require optically accurate heliostats to achieve high flux at the receiver with acceptable uniformity and light spillage. Manufacturing and assembly: it has been estimated that as much as 80% of the cost of product development and manufacture is determined by the decisions made in the initial stages of design. Concurrent engineering processes are essential for a quality, low-cost outcome for a new heliostat design, i.e. engineers across disciplines working together from the earliest stages of product design and through the design life-cycle. Make-buy decisions are important, and supplier capability is a key issue. The benefits of low-cost country sourcing cannot be overlooked. These cost drivers all favour reduced scale, and have the impact of lowering specific cost. Static wind loads: a key initial design decision is the determination of peak static wind loads, due to the sensitivity of loads (and hence material cost) to the wind specification. Design loads derived from wind tunnel tests are more accurate, and generally lower, than those derived using building codes. The wind load on heliostats can be reduced by the application of wind barriers. In addition, inner rows are partially protected from the wind by outer rows of heliostats, and for certain heliostat orientations, they may experience a reduction in total wind load as high as 90% compared to the first row. Another technique to reduce loads is to mount a porous fence at the edge of the mirror panel. This can reduce the overturning moment by as much as 40%. Dynamic wind loads: where the frequency of wind induced vibration matches a natural frequency of the heliostat structure, deformation or damage of the heliostat structure may occur. Adjusting the flow field to reduce vortex formation is an attractive alternative to increasing the rigidity of the structure. Previous work on heliostat aerodynamics has mainly addressed static wind load characteristics, while the dynamics of wind loading have not been fully understood and considered in heliostat design. Reflector technologies: mirrored glass and reflective film are the most suitable current (or near-term) options for heliostat reflectors. Polished metal and plastic mirrors both do not currently have adequate reflectance. There are around six suppliers of standard 3-4 mm lowiron mirrored glass for solar applications. Three of these can also supply thin mirrored glass (~1 mm). Glass mirrors should be considered default reflector, as they are relatively inexpensive, durable, have high reflectance and are accepted by industry. There are around four suppliers of reflective film. Reflective film technology is still evolving and continuing to improve, particularly via an active research program by 3M, and encouraging durability results. Structural mirror panels: there is a significant renewal of development in mirror facets based on sandwich panel type constructions. Two companies offer foam cored sandwich panels commercially. Sandia is also actively working with US manufacturers to develop new sandwich panel facets. Sandwich panel constructions have the following key advantages: use of thin glass is feasible, hence there is improved reflectance; and sandwich panels are very strong and rigid, and with good design can lower the mirror support costs. Structural mirror panels may also be made incorporating structural features with the largely planar mirror facets, either as integral features or by bonding to the reflector. For example, pressed sheet metal structures support the glass at both the Gemasolar and Crescent Dunes projects. Various options exist with plastics, most likely in combination with a reflective film. For example, thermoforming or compression moulding of a pre-prepared flat sheet of a thermoplastic polymer may achieve suitable optics at a competitive cost. Autonomous heliostats: development of autonomous heliostats � i.e. heliostats that do not require power or communication wiring � has progressed markedly in recent years and there is potential for significant cost compared to conventional wired systems. Alternative solar tracking systems: the majority of heliostat systems have used the �azimuthelevation� style of sun tracking. However, other styles of tracking have been used in a number of recent prototypes. These include horizontal primary axis heliostats, which are suitable for linear actuators on both axes and allow denser spacing, and target aligned heliostats, which minimise astigmatic aberration to improve overall solar capture and flux uniformity. Actuation systems: actuation systems have long been one of the key cost drivers for heliostats. The pedestal mounted azimuth drive system has been one of the main drivers to larger size heliostats. However, some technology developers believe linear drive systems are Heliostat Cost Down Scoping Study � Final Report (modified for public release)| Page 7 ANU document reference: STG-3261 Rev 01 cheaper, and can completely replace azimuth drives. Alternative drive systems, such as rim drives with cables, have been proposed to avoid the cost of pedestal mounted systems. Hydraulic drive systems have been used cost effectively on large heliostats. The scoping study has investigated in detail the current state-of-the-art of heliostat design and found that significant potential remains for deep cost reductions.